Pitting two Eurovision songs against each other to determine which is the best for no particular reason is such an original idea, said NO ONE EVER. But that won’t stop me from inflicting my own version on you poor, unsuspecting readers. Muahahaha! What makes my version different (to some of the others, maybe) is that each round will have a theme – for example, songs by the same artist – to make things more interesting (again, maybe). I’ll be picking my personal winners, justifying those decisions, and then asking you to discuss my taste or lack thereof in the comments. Now if that isn’t fun, I don’t know what is. Soon I’ll be launching a series of posts that recap Baku, so today’s debut round of song battles is aptly pitting a bunch of last year’s entries against their counterparts of 2013. From Azerbaijan to Croatia and Norway to the UK, which countries are sending better songs to the ESC this time around? Check out my thoughts, then leave your own below. Still flabbergasted by Ell & Nikki’s win in 2011 (let’s just say I was never an active member of the ‘I ❤ Running Scared’ fan club) I managed to get on board with what Azerbaijan put forward as host country last year. Heck, I wasn’t just on board – I was cartwheeling up and down the deck and making a general nuisance of myself. But I just don’t see the winning potential in Hold Me, which means it’ll probably go on and win. I think I’ve droned on about Rona on enough occasions for you guys to know I love her. But there’s always room for more droning, as far as I’m concerned! Suus is a very original and very emotional song, and with her crazy vocals it was magic on stage. Having said that, Identitet has grown on me, and I can’t believe I’m saying this, but I’m glad it didn’t get disqualified. Neither of these were originally supposed to go to Eurovision (let’s all have a slow clap for the trustworthy Belarusian NF system, shall we?) and of course, it was Alyona who was sent packing – or not, rather – in favour of cheat-free Litesound. In 2012, this was a blessing, but in 2013 I was not amused. That’s why WATH is my pick of this battle, whether in its initial rock form or post-remix disco version. Sofi and Elitsa are both women with voices of an acquired taste (unless you are instantly attracted to high-pitched shrieking) but the infectious, language-stuffed Love Unlimited trumps in the song department. I thought that was one of Bulgaria’s best ever entries, and as it just missed out on qualifying, it seems I wasn’t the only one. Hi. My name’s Jaz and I am the only person I know who liked Croatia’s entry last year (but don’t worry, I did NOT like Nina’s dress/trash bag. I have some standards). What can I say? I enjoy any song with bells in the background. Ding dong. This is really a matter of subtlety versus in-your-face, and for me, in-your-face wins. I can’t help shaking my thing to Glorious, and it’s one of the songs I’m most excited to see live at Eurovision (‘live’ in this case meaning ‘on TV’). Standing Still is a nice song and I think Germany deserved its top 10 placing in Baku, but I need more ‘oomph’ to be 110% satisfied. Hungary haven’t scored as well as they should have over the last few years IMO, and I have a feeling it’s going to happen again with ByeAlex’s absolute gem of a song. I take back what I said just then about ‘oomph’ in this case, because this is a simple but stunning song. I love Hungarian to bits as a musical language. 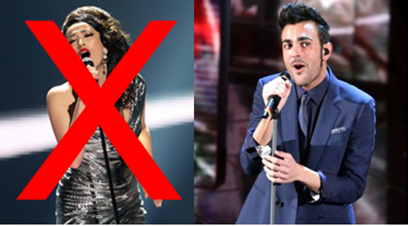 The Italy we see at the ESC is always classy, and I don’t think you could ever call one of their entries outright bad. I’m fond of Nina’s retro Italinglish number, but I’m head over heels for Marco. Er, I mean, L’essenziale. There’s something about Italian ballads that gets to me, and I think this is the best of the songs Italy has sent since their comeback. I felt like a mother being forced to choose which of her children she loves more with this one (which in my mother’s case is an easy decision. My brother just doesn’t measure up) but the decision has been made. My obsession with Stay has faded a little since it won NMGP, but I have to stay loyal to it, since it was my favourite entry of 2012 and I spent so many hours trying to comprehend it losing the final. I still love ya, Margs. An atmospheric ballad like Verjamem was a very Serbia-like thing for Slovenia to come out with, which makes sense since one of its composers also composed Molitva. Despite the similarities, I think it had its individual charms, and it’s certainly got more drama than Straight Into Love. Ukraine rarely fails to impress me. They just ‘get’ Eurovision, and they always send a top-notch artist who can belt one out (or more, if required). Zlata may be the Queen of Belters, and although Gravity lacks the quirky fun factor of her last attempt to represent her country, The Kukushka, it’s a definite contender for victory. I will be very surprised if it doesn’t considerably improve on Gaitana’s result. Another year, another big name from the UK with a slightly too old-fashioned ballad. Still, at least they’re going younger. At this rate we should get an entrant under the age of 30 by 2025. But let’s not be ageist, not when this year’s song is a lot better than the last. It is to me, anyway – I tried to love Love Will Set You Free, but eventually the charade became too much and I had to call it quits. Believe In Me is more current and a lot catchier, and after a couple of listens I was willing to wave a Union Jack with genuine enthusiasm. If those numbers are any indication, the standard of 2012 was higher than the standard of 2013 in my book, though not by a massive margin. Now it’s your turn to battle. I want to know if you totally agree with me, partly agree with me…or think I’m bonkers with a side serving of very poor judgment when it comes to the above duels. Which songs would be your winners? Posted on April 5, 2013, in Eurovision 2012, Eurovision 2013, Song Battles and tagged Azerbaijan, Bonnie Tyler, ESC, Eurovision 2012, Eurovision 2013, Eurovision duels, song battles, UK, Ukraine, Your hair looks nice today, Zlata. Bookmark the permalink. 10 Comments. Yes! There are three of us now! There a a few times I think Croatia should have qualified when they didn’t. I love this idea regardless of how original or unoriginal it is..
Azerbaijan: 2012. Both bore me to death, but I go with Sabina. Bulgaria: 2013. Not a fan of their voices, but I like the instruments in this year’s entry. Croatia: 2013. I’m addicted to this one. Germany 2012. Both are unoriginal and radio-ish but for some reason I really like “standing still” why glorious bores me which is funny since it should be the other way around..
Hungary: 2013: agree with everything you said. Italy: 2013. First time I really like an Italian entry since 1997. UK: 2013. Don’t like either though. So I get exactly the opposite results: 42% for 2012 and 58% for 2013. But I still think 2012 was better..I don’t know I’ll see in the next rounds I guess. Hungary FTW. In my fantasy land, at least. Balkan ballads are the best ballads. Period. Give me any one over Russia’s cheese of 2013. Yeah, I don’t think 12 songs was the best indication of which year was better. But I agree, I think it is 2012. But there are some really good songs this year. There’s only a few I hate. We agree on everything but Slovenia and Germany. I like that. On the overall, I’ll probably tend toward 2012 for most countries. It was a fantastic year. Now I kind of want to do this on my blog, even though I’m already doing the 30 Day Eurovision Challenge. Oh, I forgot about Ukraine. I prefer Gaitana to Zlata, so we disagree on that too. HOW DARE YOU!!!! Over it =P And now I have ‘na na na na na na na nananana na naaaaaaaaaaah’ stuck in my head. Ukraine just know how it’s done. Agreed. 2012 was better. But I can’t help favouring 2013 in some cases. I think it seems to exciting to me because of the novelty of new songs, whereas I’m …not sick of, but very well acquainted with the Baku lineup. But, say, Hungary, for example, I feel have 100% picked a better song this year. PS – Do itttt!! If you have time/space. Definitely. And there are also a few exceptions, like Hungary, Spain, and Ireland. But that’s it.